With the current light-box exhibition from Daily Life Ltd. due to finish next week (December 16th), there is just one more event planned for the square this year: Make a note of the date Saturday December 20th, 4.30pm to 6pm. 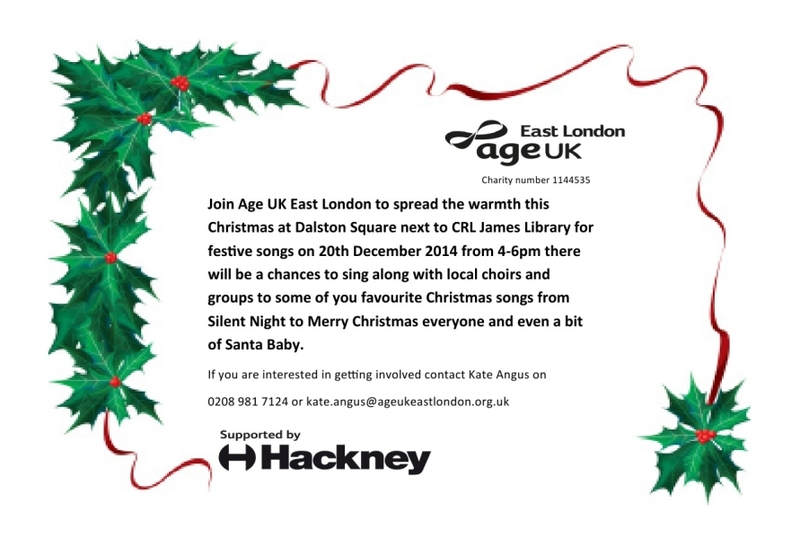 Organised by Age UK East London, there will be carol singing, mince pies, and mulled wine (tea and coffee will also be available). Choirs from across Hackney will be singing festive carols hoping you will sing along. All monies raised through sales of refreshments (and of course the collection buckets that will be present) will go to help Age UK East London continue their as-necessary-as-ever work throughout the region, and spread the Christmas cheer to those less fortunate than us. Please show your support and pop down if you are able to. And speaking of events and charity, the Eastern Curve Garden are running a whole host of events in the run-up to Christmas. To get in to the festive spirit and support them in their fabulous work of maintaining this delightful little oasis, check out their list of upcoming events HERE. This is a subject that has been broached before, but it seems it needs to be re-iterated. After this week’s break-in to the Consort staffroom in Thomas Tower (and subsequent theft of staff personal belongings), and the ejection of non-residents from Collins Tower, it is clear that many people are still not getting the message that tailgating is a problem throughout the square that puts us all at risk. If someone tries to follow you in to your building (or tries to enter whilst you are exiting) ask to see their fob before allowing them entry. It is all very well being polite and holding the door open for people, but it is simply asking for trouble. Although these events are rare, apartments have been robbed, and stairwells have been used for drug taking and dealing. How long before we have a mugging or somebody gets hurt? And all of this is so easily avoided: Stop the tail-gaters. And if you find someone holding the door for you, thank that person for their politeness but also enlighten them to their thoughtlessness: They are putting you and all the other residents of your building at risk. NO FOB – NO ENTRY! It could not be simpler. Just to state the obvious, do not put yourself in danger during any confrontation: If you are threatened in any way, or even feel threatened, get yourself out of the situation and report the incident immediately to the concierge service either in person or by telephone on 02072547341 and they will investigate further. As many will be aware, there was a bit of a panic a couple of weeks ago when news came through from Hackney Council that Barratt had withdrawn their planning application for the proposed ventilation system to cure the restaurant smoke and odour problem plaguing phase 1 buildings (Gaumont through Labyrinth). After many emails and phone calls, including the help of local councillor Peter Snell, it has been determined that this was an error on the council’s part who accidentally deleted the application. This has though now been reinstated, and we are hoping for a decision soon: Preferably a positive one. More news as soon as we have it. To continue the tradition of advertising Dalston Square businesses and the businesses of Dalston Square residents, here is a quick plug for Labyrinth Tower resident Patricia. Patricia is starting new sessions of her family oriented yoga classes early next year, which will be held in the Young Hackney building in Forest Road. Patricia is an experienced yoga teacher, working primarily with newcomers and children, she hopes to attract your whole family to her new sessions: All ages, and all experience levels are welcome. To enrol for these new classes, check out her website HERE. If you are interested, and a Dalston Square resident yourself, take the flyer you will find in your letterbox during the coming week to your first session for a special (and very neighbourly) ‘Residents Only’ discount of 40% on that session (£6 instead of £10). The new sessions start on January 10th 2015, and will continue every Saturday from 11.15am to 12.15pm: What better way could there be to energise your weekend! As I am sure everyone is by now aware, fire gutted Nancy’s Pantry, the children orientated restaurant here in the square, early this past Tuesday morning. The fire started at around 7.30am and was attended by 6 fire tenders and 35 firemen and officers from Shoreditch, Homerton, Stoke Newington, and Islington fire stations. A dozen residents from immediately above the restaurant were evacuated as a precaution, but the fire was contained within the restaurant and fully extinguished by 9.30am. The fire, it seems, was caused by an electrical fault, possibly with a refrigerator or the socket it was plugged into: The fire brigade are investigating and will no doubt report back soon. Why did audible alarms not sound throughout Labyrinth Tower when the fire detectors were triggered? The answer is very simple: There are none (despite the fact that the fire warning instruction signs posted within each block are based on what to do on hearing alarms). There are of course smoke detectors with audible alarms in each and every apartment, but in public areas the smoke detectors have no alarm attached, and for a very good reason: In the event of fire, you are supposed to stay put in your apartment (unless a) the fire is in your apartment, or b) you are instructed to evacuate by fire and/or safety officials). If there were audible alarms throughout the building, people would attempt evacuation without knowing where the fire is, potentially heading in the direction of the fire. If you are unaware of the drill in the event of a fire anywhere in the square, the official fire policy document for Dalston Square is available for download at our discussions forum HERE: Please do read it if you have not already done so. How did smoke manage to infiltrate the stairwell of Raddon Tower next door? As yet we have no answer as to how the smoke managed to cross from one block to it’s neighbour (something that certainly should not be possible), but this is being investigated and will hopefully be rectified soon: The DSRA will follow this issue over the coming weeks. Why did the AOV (Automatic Opening Vent) system fail to clear the smoke from Raddon Tower’s stairwell? There was simply insufficient smoke for it to make it from the stairwell into any of the corridors where the smoke detectors would have triggered the system. For those not familiar with this system, check your hallway and you will see a panel somewhere in the wall labelled ‘Smoke Shaft Door’. In the event of the smoke detectors being triggered, these ‘doors’ open to reveal a large vent system. At the same time, powerful fans on the roof of the block kick in to push huge quantities of fresh air down through the stairwell, strong enough to push open the fire doors leading from the stairwell into each and every floor’s corridors, and thereby forcing any smoke in those corridors out into the vent system: Very clever. Remember that it is estimated that at least half (and by some estimates as many as 80%) of all fire deaths are due to the inhalation of smoke rather than burning. Finally our persistence in pursuing Barratt with regard an extraction system for the kitchens of the restaurants in phase 1 (the eastern side of the square) has borne fruit. 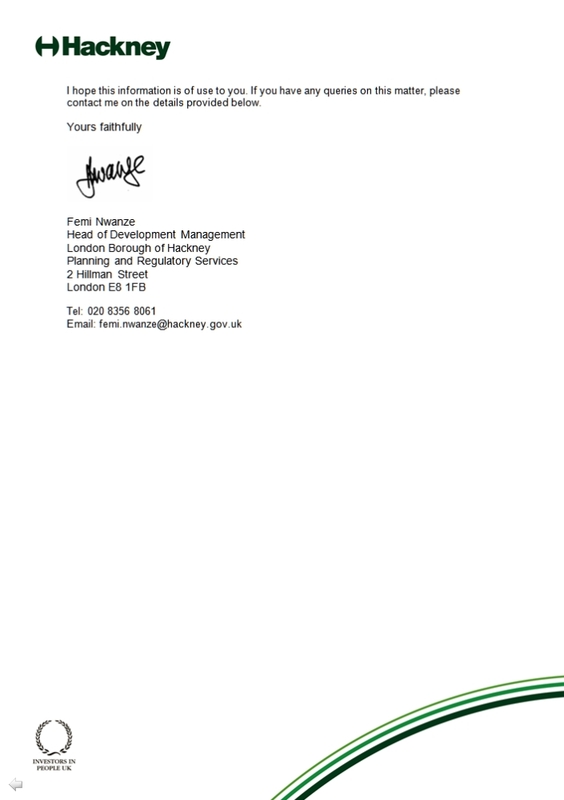 Barratt have now submitted plans to Hackney Council to retro-fit a proper, above roof-line, extraction system. Currently all these restaurants simply pump their smoke and fumes into the rear service tunnel (that runs from Gaumont Tower through to Labyrinth Tower) from where it is finding it’s way into lobbies, and up into the residential parts of each block. As is usual with this king of planning application (a visual change to Gaumont Tower as the ducting will be fitted to the outside of the rear of the block), the council is giving the general public the opportunity to comment on the proposal. Residents of Gaumont Tower have received direct communication from the council regarding this, but for other phase 1 residents who have supported our campaign, not received this letter, but who would like the opportunity to comment on the application, the process can be done online HERE. All comments must be in by 26th September so get your comments in soon. For Phase 2 residents who are concerned that they will experience a similar problem when the Japanese restaurant in Thomas Tower opens for business, worry not: You already have a proper extraction system in place. Firstly, a reminder that Hackney Council’s ‘open to the public’ meeting, where developers will make a pre-application presentation of their plans for the redevelopment of Kingsland Shopping centre, is tonight: Stoke Newington Town Hall, 6.30pm. See my last post to this blog (second paragraph) HERE for full details. 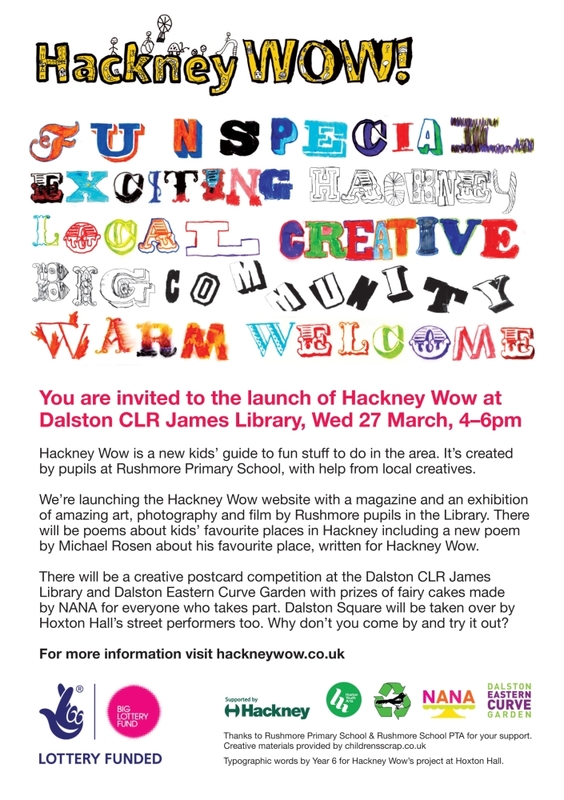 Secondly, a reminder that Wednesday next week, 5th March, will see the next meeting of Hackney Unites’ ‘Dalston Futures’. Under discussion will be their latest project ‘Speak Out’. Full details can be found HERE. And lastly, to unite the previous 2 topics, Dalston Futures are building a petition regarding the Kingsland Shopping Centre redevelopment. Their aim is to force the developers into discussion with the local community. As they rightly point out, this will have a huge impact on the people that live here and yet at no point has the community been asked their views. For full details follow THIS link, for the self explanatory petition itself click HERE. I have, this morning, posted 3 new Consort ‘Alerts’ to the forum: Sanitisation of the Phase 3 sub-basement has begun as promised, but will take a little longer than expected to complete; cleaning of communal carpets throughout the development has begun this week; Phase 2 bicycle storage unit to be emptied by Friday next week. All 3 ‘Alerts’ can be read in full in our forum HERE. Hi all. As promised I have a bunch of news and updates for you, but have decided that rather than bore you all with a monster long post, I will break it down into, probably, 3 posts of related topics. To get the ball rolling then is news of recent and upcoming development proposals that are close to home. First off, the proposed development of the Holy Trinity School site at the south-east corner of Dalston Square. I have referred to this development several times over the last 6 months or so, and there are a couple of threads over at the forum (HERE and HERE) that document the work of a truly dedicated team of Dalston Square residents (who have been battling to stop Telford Homes’ ludicrous plans), and so will go no further into the details. 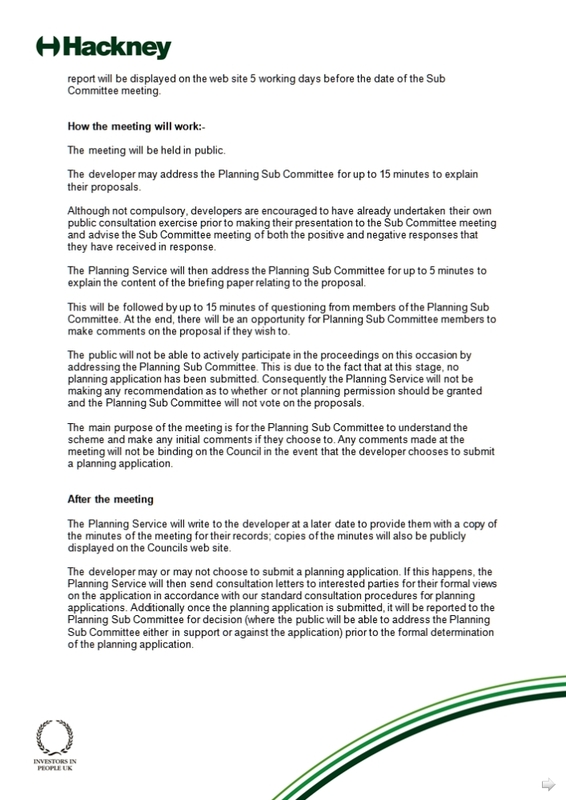 The news though is the decision, decided at the council’s public planning meeting last Wednesday, that the application has been rejected. This is excellent news and proof that democracy and a well presented argument can still stop big developers in their tracks. Whilst plans to expand the existing school to provide much needed school places was generally accepted as a good idea, Telford’s attempt to use this as an excuse to build 101 apartments that would have seriously affected current and future residents of both Dalston Square and the Rhodes Estate, it was argued, was simply unacceptable. The application was rejected on the grounds of not sticking to the council’s own DAAP (Dalston Area Action Plan), and issues with the design of the proposed structure. After celebrations had died down, the Dalston Square team unanimously decided that an approach would be made to the principal of the school to see if any assistance could be offered with regard finding sources of funding that would allow the school to go ahead with expansion, without the need to involve big property developers. A magnanimous gesture I am sure you will agree. Now though, there is a new cloud on the horizon. 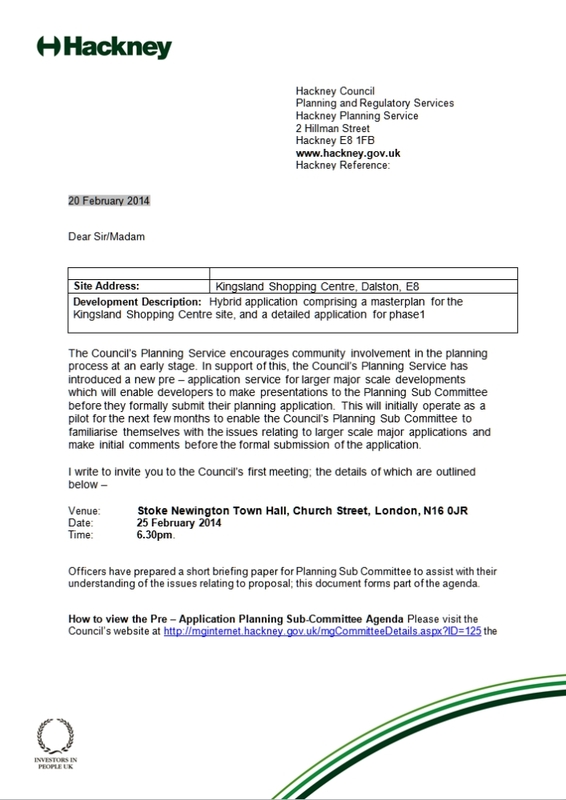 Ben Collins, as Chair of the DSRA, was recently approached by a consultancy with regard a pre-planning meeting on the proposed development of the Kingland Shopping Centre. If you are unfamiliar with this proposed development, Loving Dalston did a piece on it HERE, and Dalstonist covered the story HERE. More high-rises (up to 14 stories in places), more high-rent retail space (no doubt to be filled with the same chains you find on every high-street these days), a serious threat to Ridley Road market, and the loss of the Eastern Curve Garden are all on the drawing board. The DSRA is discussing where we go from here and will work on a plan to ensure that, as with the school development above, the interests of developers do not drive forward a project that is in the interest of neither local residents nor local businesses. If allowed to proceed as currently planned this would completely change the village we love. Watch this space for updates as the consultation process progresses and more details become available. That’s it for this post, the next installment of news……..